Plan of Shoreditch in the City of London, from J. Strype's edition of J. Stow's Survey of the Cities of London and Westminster published in 1754-56. The plan features title in cartouche at the top of the plate, scale bar and compass at bottom left and key to streets, yards, squares, churches and public buildings in tables at top left and lower right. A dotted line marks the boundary between the parish of St Leonard Shoreditch and St Giles Cripplegate. 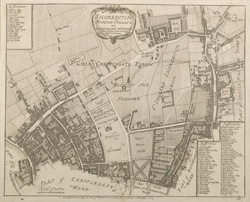 Hoxton Square, where the development of Shoreditch began in the 1680's is indicated at top right.